Androgenetic alopecia – male pattern baldness, the most common form of alopecia. Alopecia areata – where hair falls out in patches. Alopecia totalis – the loss of scalp hair. Alopecia universalis – the complete loss of all body hair. * It is not known what causes hair loss but there are a number of factors associated with alopecia including genetics, immune system disorder, poor circulation, aging, hormones, surgery, pregnancy, menopause, stress, diabetes, chemotherapy, iron deficiency and skin disease. * The thinning or falling out of clumps of hair. * Do not blow dry or towel dry hair, avoid combing wet hair and avoid the use of brushes and fine toothed combs. * Avoid harsh chemicals on the hair as they may provoke an allergic reaction. Use natural pH balanced hair. * Daily massage of the scalp stimulates circulation to the region. Treatment for hair loss is limited. Rogaine has FDA approval for the treatment of male pattern baldness however it has limited success and there can be serious side effects with the long-term use. VITAMIN C – improves circulation, helps with stress and helps the immune system. 3,000 – 10,000 mg daily in divided doses may help. Do not use more than 5,000 mg daily if pregnant. Use esterified vitamin C if you use aspirin. Large doses of vitamin C may cause diarrhea, may deplete the body of copper and affect the reliability of oral contraceptives. BIOTIN – needed for the health of the hair. Deficiency of biotin has been linked with hair loss. 100 mg daily may help prevent hair loss in some men. Note raw eggs, heated oils and fat, saccharin and antibiotics may inhibit the absorption of biotin. 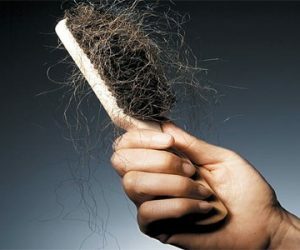 IRON – deficiency of iron has been linked to hair loss. Natural sources of iron include brewer’s yeast, soybeans, seaweed – dulse and kelp, chamomile, dandelion, lemongrass, alfalfa, prunes, sesame seeds, peaches, lentils, blackstrap molasses, almonds, rice and avocados. If taken in supplement form use according to label instructions. ZINC – stimulates the immune system, deficiency of zinc has been linked with hair loss. 50 – 100 mg daily may help. Natural sources of zinc include brewer’s and torula yeast, dandelion, alfalfa, chamomile, parsley, mushrooms, soybeans, sunflower and pumpkin seeds, lima beans, pecans, seaweed – dulse and kelp, legumes and rose hip. Excess zinc intake may cause copper deficiency. For prolonged periods of zinc intake, copper is recommended ie: 30 mg zinc with 2 mg of copper. Do not use more than 100 mg daily as excess zinc may depress the immune system. HORSETAIL, SCOURING RUSH, SHAVE GRASS, BOTTLEBRUSH, SILICA. – strengthens the hair. Use according to label instructions. Do not use if pregnant.